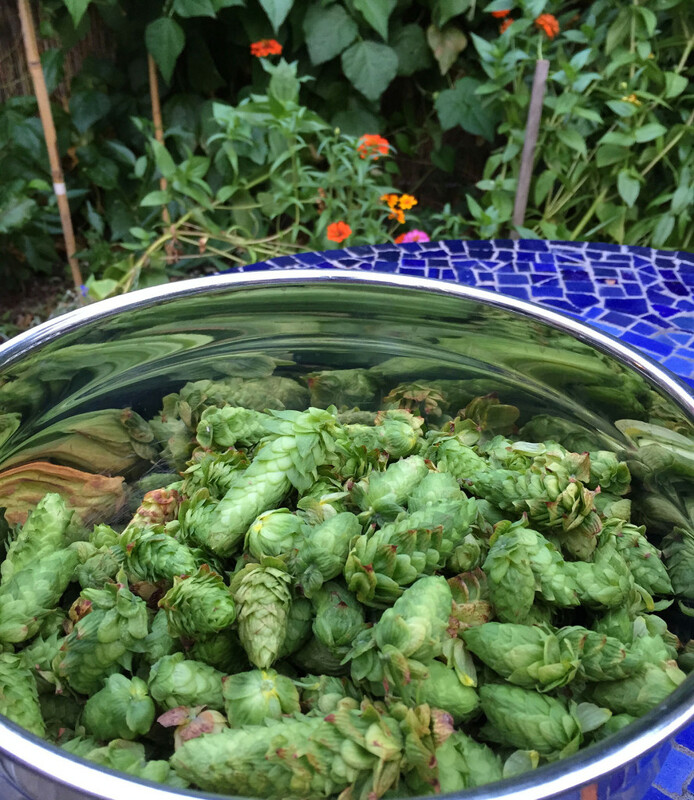 I wrote about planting the Cascade Hops in their first season, 2014. 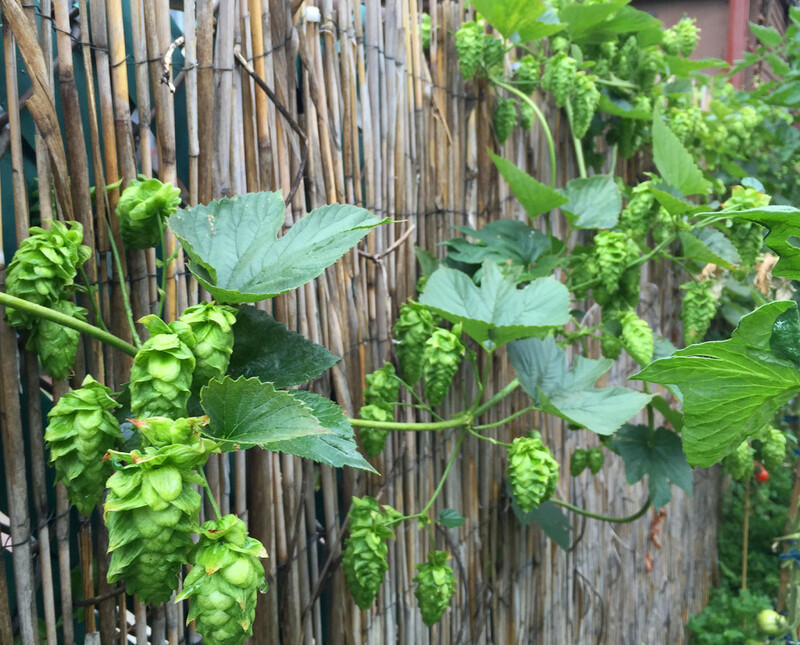 In April of 2015, the hops, now in their second year, had clearly survived their first winter in their planters. They had sprouted new shoots and were on their way up towards the fence I was trying to train them on. 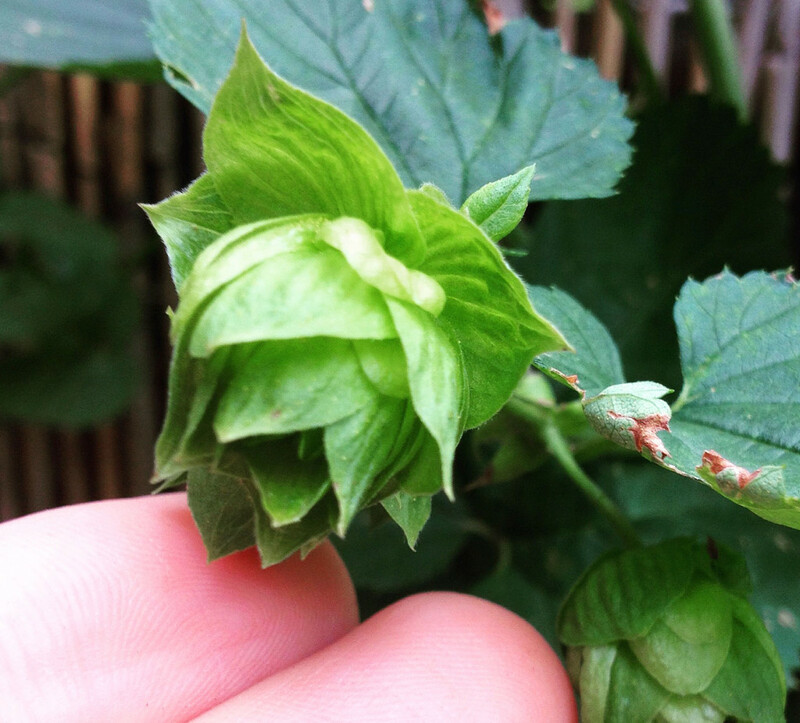 By the end of May, little hops cones were forming and the foliage was looking healthy. I had cut the bines back to the three thickest ones and pruned the rest, so as to concentrate the plant’s energy in producing cones rather than growing a lot of stem tissue. 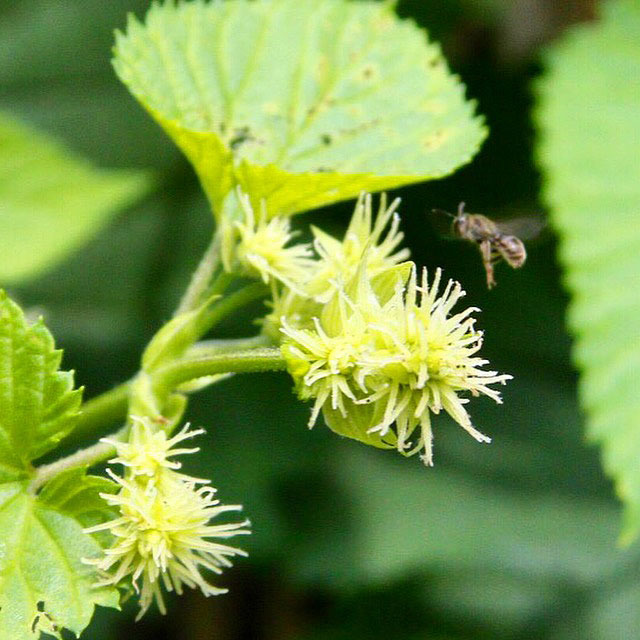 Here a tiny bee comes to visit a newly sprouted cone. Probably 1/4″ long. 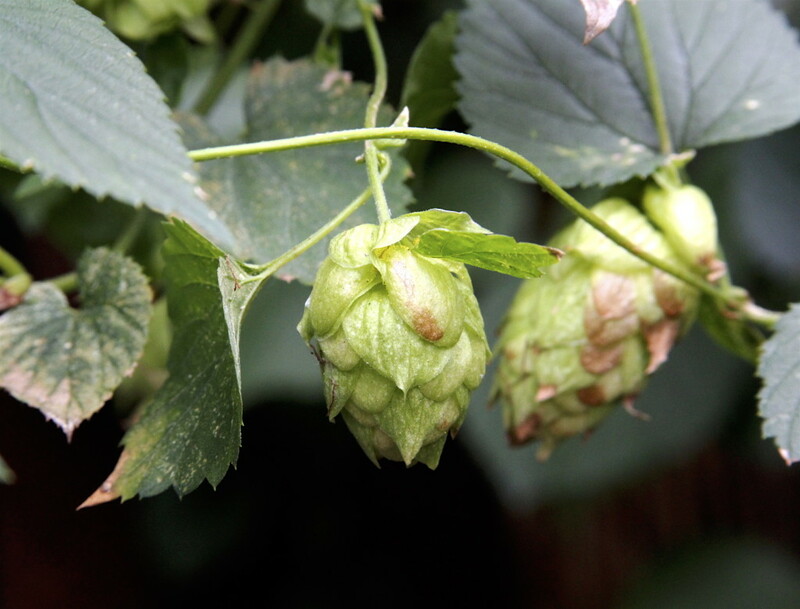 By the middle of June, we could see the hops cones shaping themselves into their classic little green bells. Over the course of the season, they spread out nicely along the fence on both sides of the garden. I was originally concerned that they would prefer a vertical climb, but that doesn’t seem to be the case. The only thing that stands in their way in our spot is when they run into the beans and tomatoes that they are sharing the fence with. Like most plants in the garden, they prefer lots of sun. 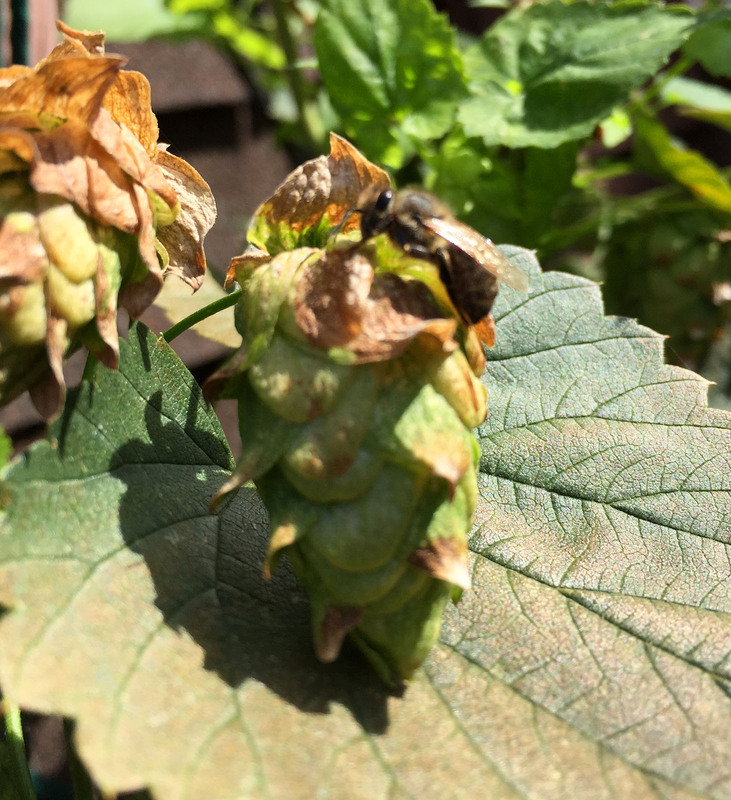 The cones which get the most sun ripen quickest, while those that lie buried beneath layers of leaves look a bit anemic and ripen more slowly. The cones were large and healthy-looking by late July. It was time to start thinking about partnering up with some people to put these to use. 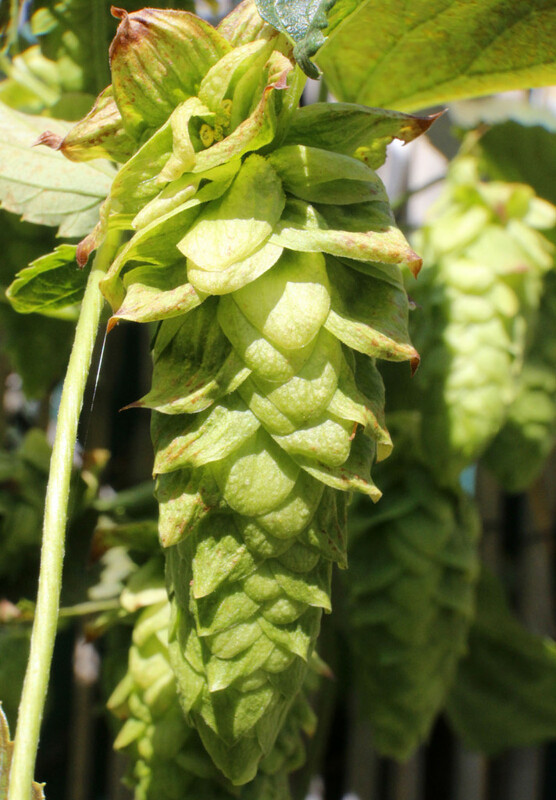 A bit fuzzy here, but you can see that pulling a hops cone apart should give some idea of how the resinous glands of Lupulin are doing. 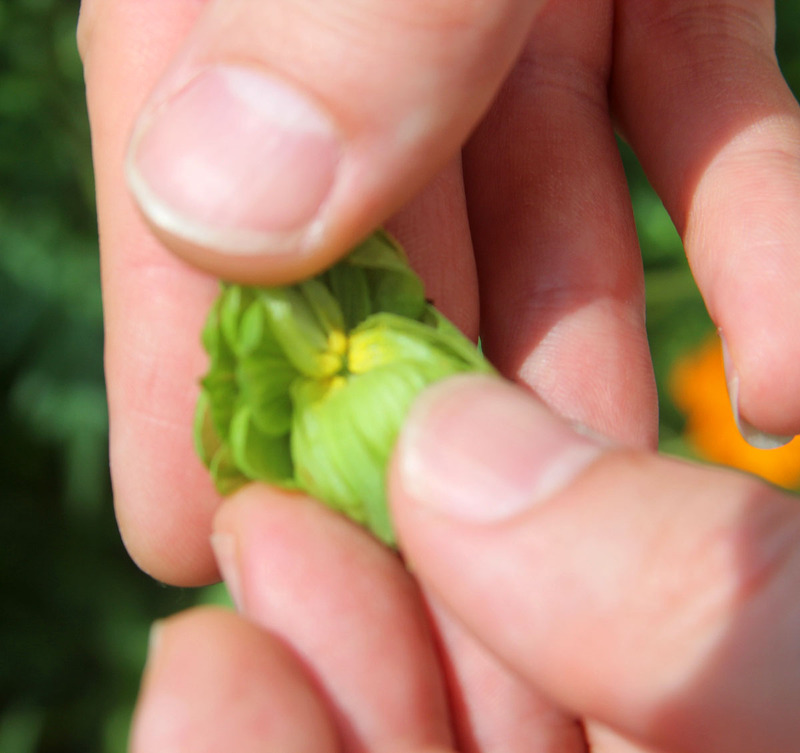 This yellow substance produced by the plant is what gives hoppy beer its flavor. 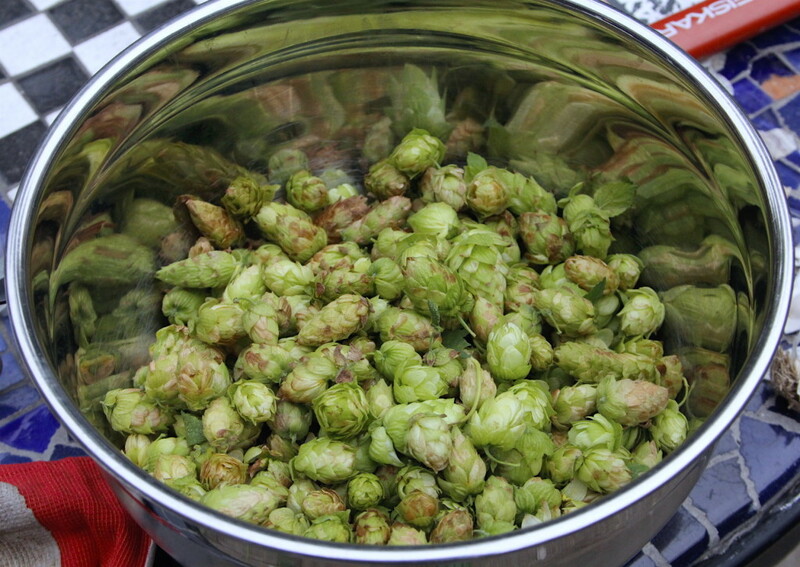 Hops cones picked before their prime won’t have enough lupulin, possibly leaving the beer tasting more grassy than hoppy. Here, one of the largest cones, probably almost three inches long, is starting to show some color in the shoulders or upper area. It’s approaching the moment of peak harvest, perhaps two or three days away. 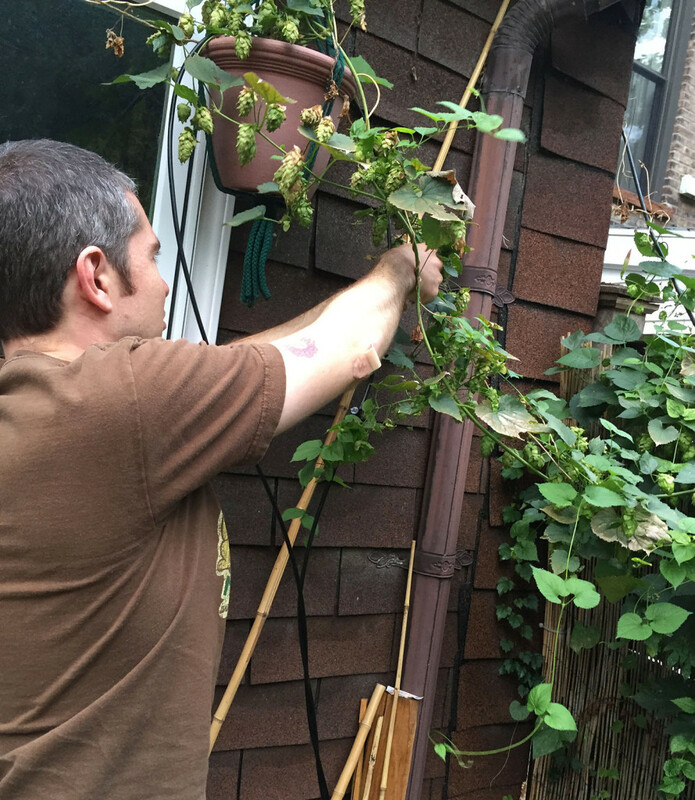 I learned about hops ripeness from this video by BobbyFromNJ, here. He gives a good description of what to look for. 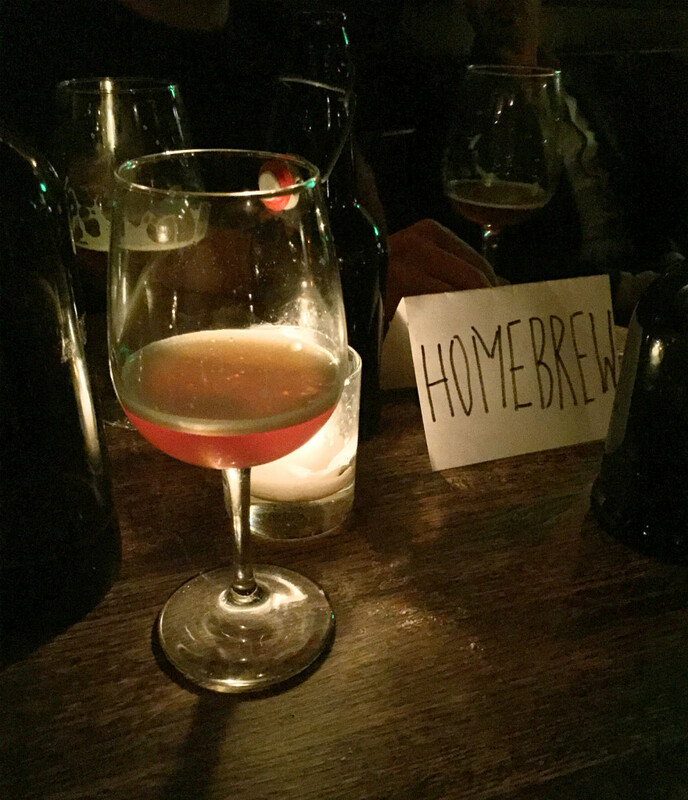 In late July I had gotten in touch with the Brooklyn Homebrew Meetup group. I happily attended a meeting in a bar in which Kevin (the group’s founder) and Dustin shared their homebrews, and I brought a fresh hops sample along as well. After some pretty brutal negotiations stretching into the wee hours, we agreed to share—hops for beer. I followed up with them and they stopped by to help out with some picking when the time came, and it came soon. 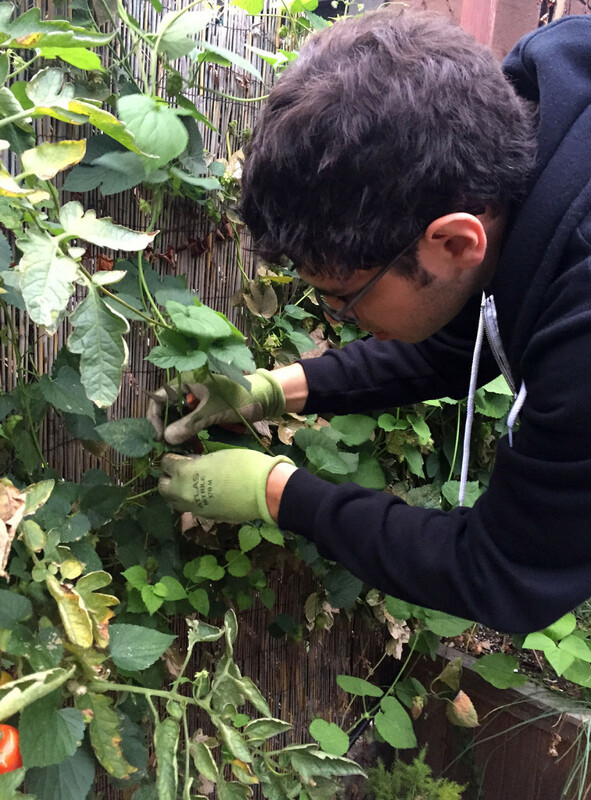 The first harvest of the season came from both of the two Cascade rhizomes, more than doubling the previous year’s harvest which had only come from one of them as the other had not produced yet. We picked over 300 cones in mid-August this year, totaling three-quarters of a pound if I remember right. Kevin and Dustin split them up evenly and went off to start brewing an IPA and a black IPA. I have no photos from the harvest day, except for the result. About four or five weeks later, the next Brooklyn Homebrew session was held, at which I got to try both beers brewed with the garden’s fresh hops. Pretty darn good stuff– these guys know what they are doing. We agreed to a second harvest. By late September, the foliage on the hops had taken a turn for the worse, perhaps developing some kind of ‘rust’ disease, but the hops cones themselves were doing all right. I use neem oil as an organic disease deterrent on some plants, but I wouldn’t use that on something that’s going to be used in a recipe like beer where the flavor could be affected. I’ll have to research what my options are a bit more. Here, during the evening of the second hops harvest, we had a few more beers that had been brewed from the first a month earlier. About 500 cones in all, smaller ones than the first round. We made it into a BBQ and had a couple of other folks from the Meetup as well. We divvied up the hops amongst the attendees, who went off to brew some beer in the next few days. 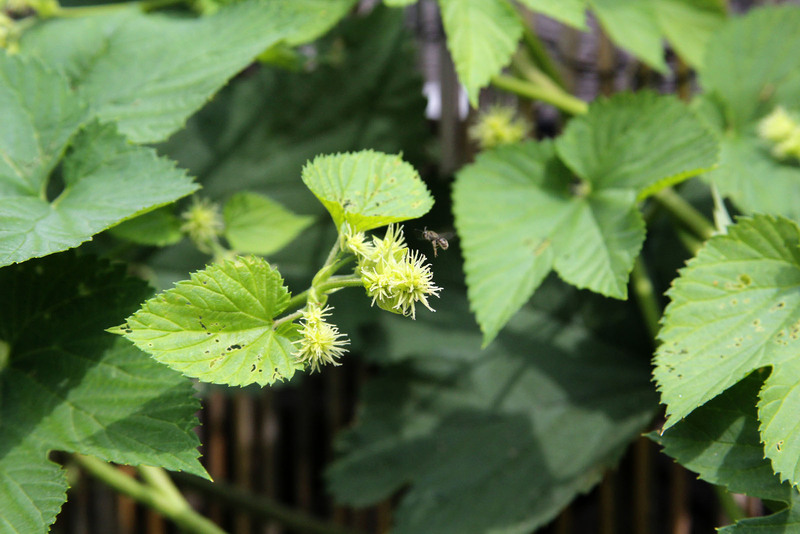 By the end of the season, many of the hops plants were winding down, suffering from a bit of disease. 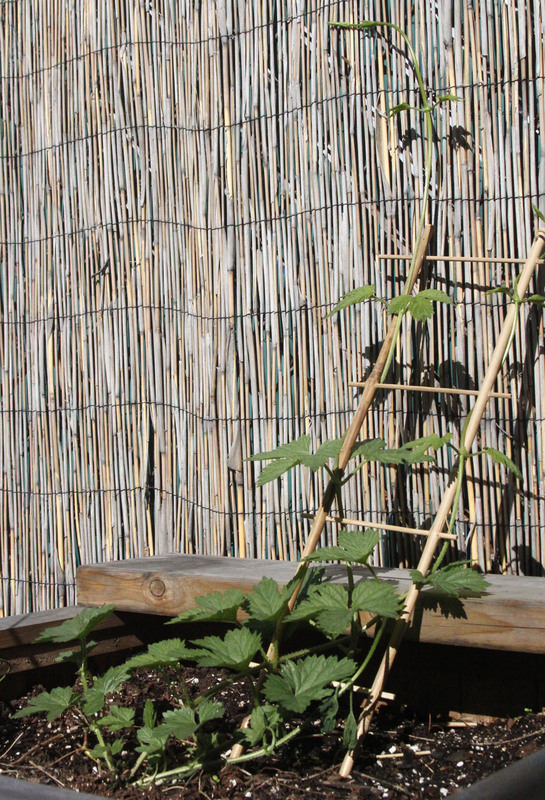 Since we are not growing hops vertically (yet? 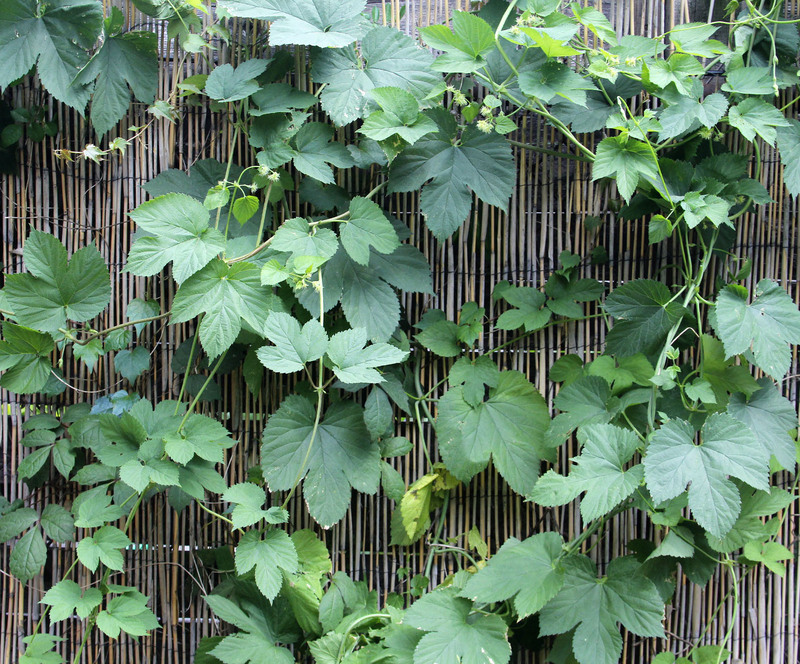 ), many of the cones get shaded by the tangle of bushy leaf growth along the low fence. Cones which get less direct sunlight seem paler, smaller, and a little anemic. Breaking them open when they appear to be ripe shows smaller glands of lupulin, and they are less fragrant. Nonetheless, a third harvest was in order as I was about to cut back the bines for the winter. The rhizomes survive and will send new shoots up in the spring. This harvest, I managed myself in half an hour. Smaller than the previous two, and again the cones looked a bit weak. 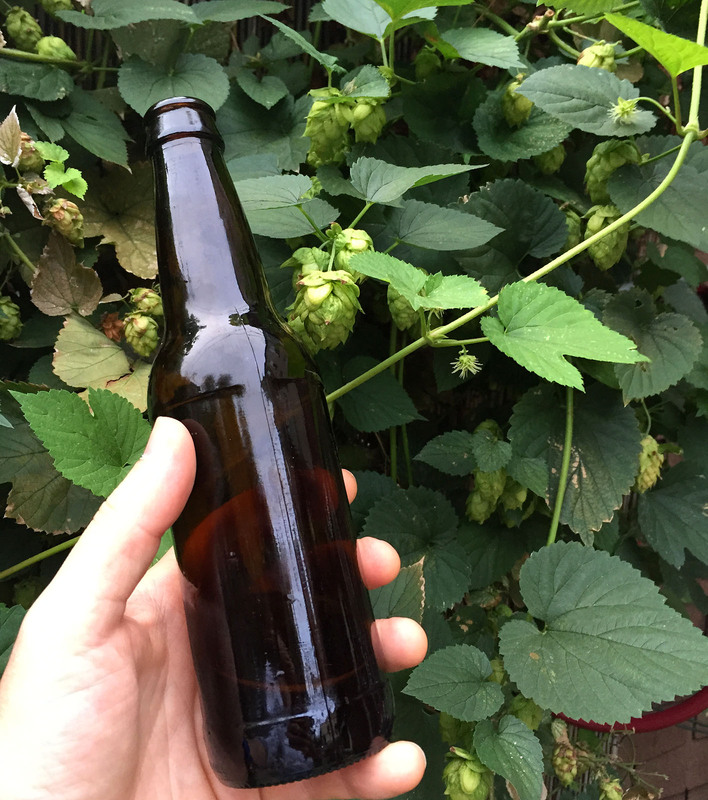 But hops is hops, and after storing them in the fridge for a few days, I was able to find another local homebrewer to give them a shot. I had about eight times the wet weight of harvest as compared to the previous year. Hard to complain about that.